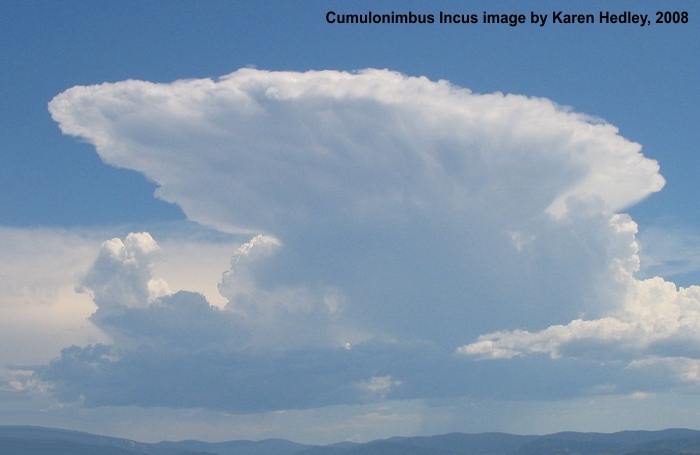 Last week we looked at a relatively minor storm system that formed over a nearby lake. 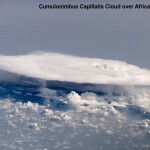 In the process, we learned about the important meteorological components required to generate such systems. We’ll be looking at a much larger system this week — it involves some additional components, and can teach us more about these violent natural phenomena. The photo above was taken on August 30, 2015, just as the Sun was setting (around 19:00 MST). The view is to the southeast. This is a massive storm system. 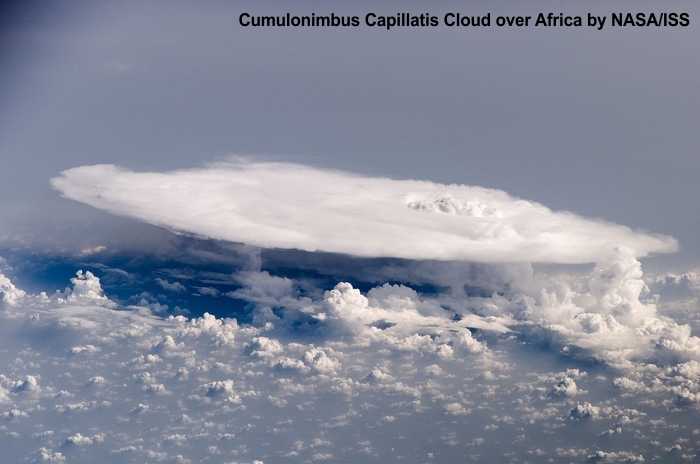 The cloud you see is categorized as a cumulonimbus, and for this system, the top of that cloud was at an altitude of maybe 8000 meters (26,000 feet). If you want to see the original image, uncluttered by labels, click on the thumbnail below. Distance to the cloud was maybe 80 km (50 miles). It formed over the Phoenix metropolitan area, a sprawling mass of concrete, asphalt, clay tile roofs, swimming pools, golf courses, and far too many green lawns. Including outlying towns and suburbs, the total area is 23,500 km2 (14,600 mi2). The heat stored during the day is orders of magnitude greater than that of Lake Pleasant. Follow that link for last week’s post about the smaller storm system. 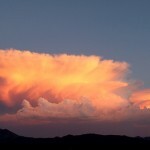 Local meteorologists claim that “Phoenix makes its own weather these days.” There’s so much hot humid air rising around sunset that, lacking some external weather system moving into the area, Phoenix will build its own clouds. Particulates abound, from natural desert dust to emissions from traffic (the 2010 census put the population at 4,192,887). And during monsoon season, there’s additional moisture arriving from the Gulf of California. The August 30 storm was a big one. 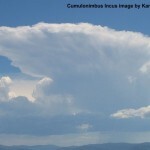 Microbursts damaged trees and structures, hail was reported in some areas, normally dry washes carried flash floods and stranded vehicles, lightning strikes started brush fires, and power was out for 55,000 residents for most of the evening. Read more about it here (if you can tolerate the popup ads). Three components of this system dominated those of the Lake Pleasant system. The altitudes reached by the convecting air were far below the freezing point, hence the hail. 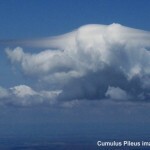 Convection overshoot was molded into the classic “anvil” shape by upper-level winds. And the volume of mixing air generated large electrostatic potentials, hence the lightning. For more on the physics of lightning, see my 2014 July 21 and July 28 posts. 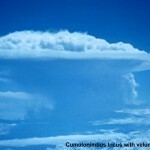 What made this such a “perfect storm” was the confluence of heat, moisture, particulates, and total energy. The heat gathering area of Phoenix is 23,500 km2/30 km2 = 783 times larger than Lake Pleasant. And it’s heat energy that fuels these storms. 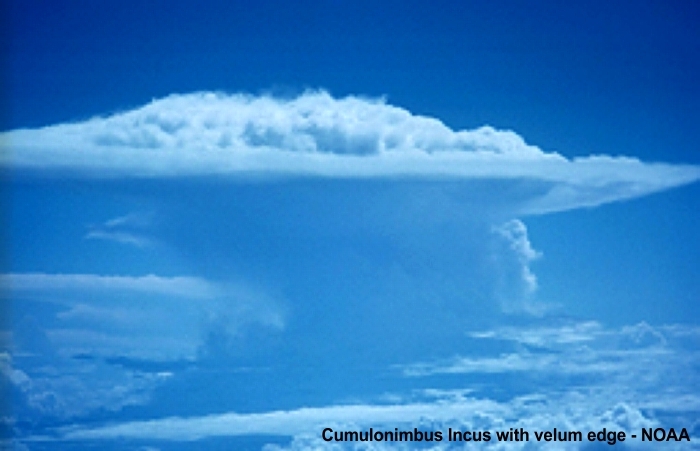 I called this storm cloud a cumulonimbus, but if you followed that link, you’ll see there’s an extensive array of sub-varieties. Click on the thumbnails below to see some specific examples. 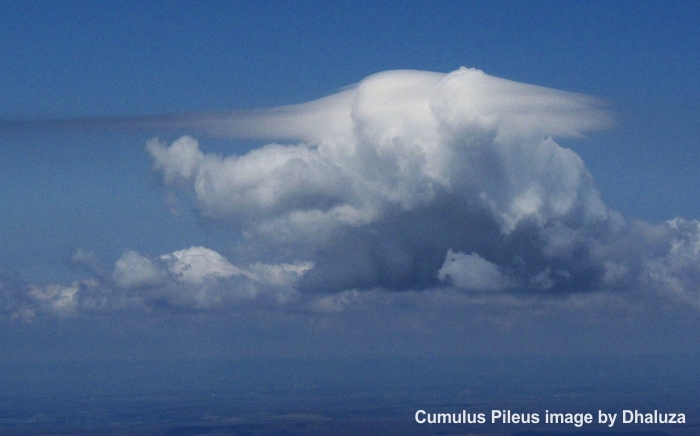 So maybe I could label the cloud in my photo as “Cumulonimbus Capillatis with a velum, anvil, and pileus, accompanied by a lower layer of rain-producing pannus.” But as physicist Richard Feynman liked to say, “Just because you can give something a name doesn’t mean you understand it.” And truth be told, there’s so much energy being released in a system this size that lots of features overlap. I only labeled those I could positively identify.